Mehrauli Archaeological Park, spread over 200 acres, is a historical park next to the Qutub Minar. It has 100 historically significant monuments, holding over a thousand years’ worth of Delhi’s history. 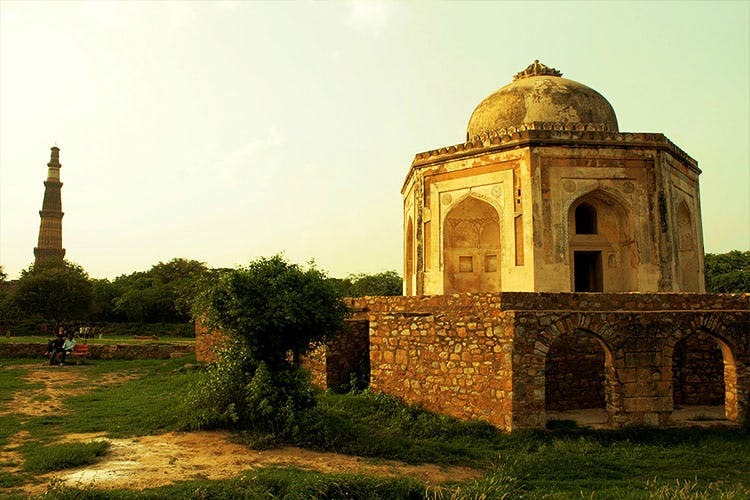 The park contains ruins of monuments built as long ago as 1060 CE, to architectural marvels from the ruling eras of Khalji dynasty, Tughlaq dynasty, Lodhi dynasty, and the Mughal Empire—an epoch lost to succeeding aeons. The first monument you see upon entry is Balban’s Tomb, a huge beauty (even upon being worn and torn) with an eye-catching Roman Arch as steep as they get. The era of the Lodis comes to mind next with the Jamali Kamali Mosque, which you’ve probably heard of, with its elaborate artwork inside. It’s one of the few monuments which have been genuinely upheld and protected. A little further on the walking trail, there’s the Metcalfe’s Dome, primarily built to peer at the Qutub Minar in all its glory. You also get to time travel back to the Mughal Era with Quli Khan’s Tomb, peek into the Slave dynasty with Khan Shahid’s Tomb, and gaze at ancient step wells. Patches of lush green, young kids playing cricket, while a historical vibe pervades the atmosphere throughout. The park opens at 5am and closes at 6.30pm, so you could go here for an early morning visit, or for some sundowner photography.